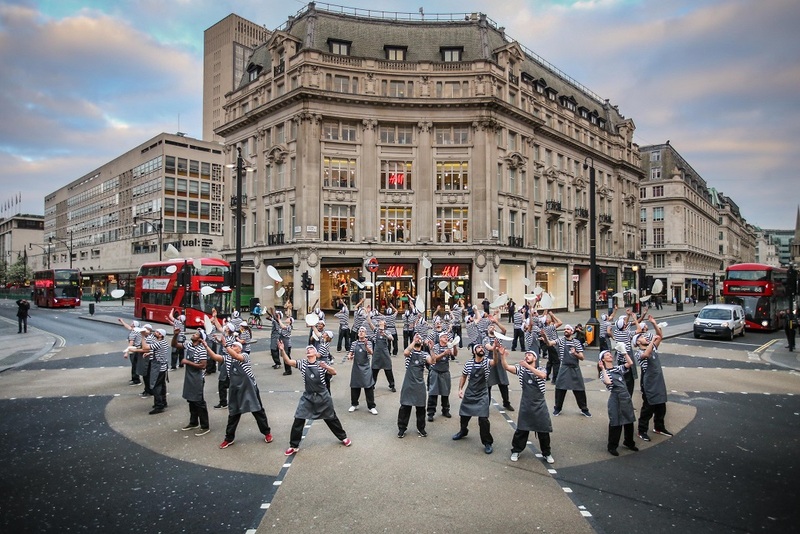 More than 50 pizza chefs brought Oxford Street to a standstill today with a synchronised pizza flare. 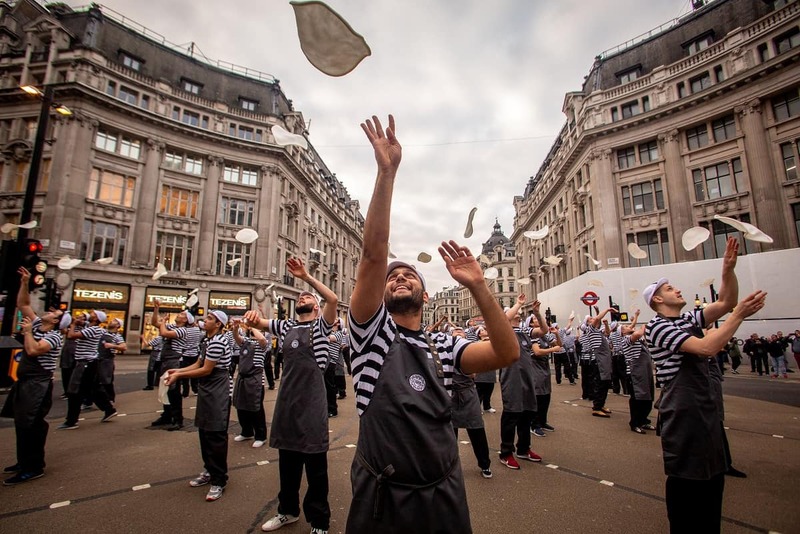 The 54 pizzaiolos produced a traffic-stopping display as they tossed and span the pizza dough in unison – wowing onlookers with the eye-catching performance. It marked two landmarks for PizzaExpress – 54 years since its first restaurant opened in London’s Wardour Street, and the opening of its new Langham Place, Oxford Circus pizzeria. 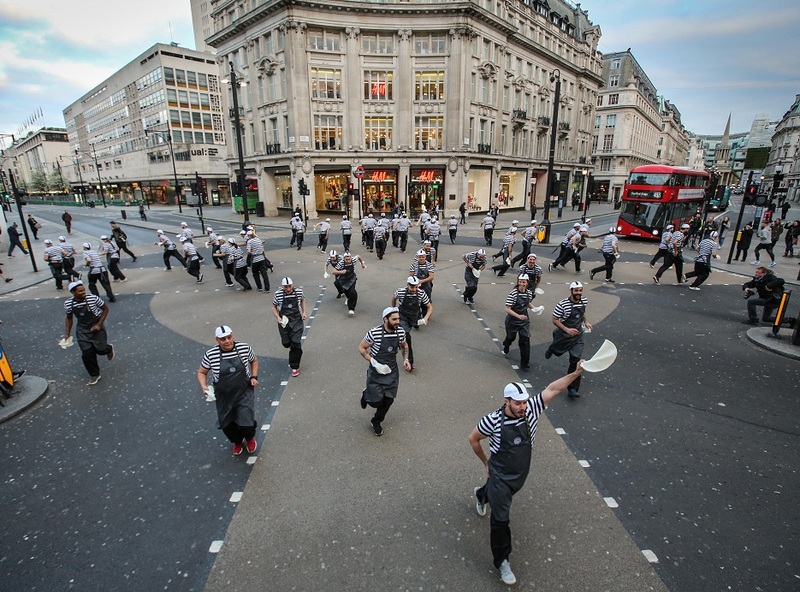 The impromptu performance – which saw pizzas thrown to heights of up to 15 feet – lasted just a matter of seconds and featured pizzaiolos from across the UK. Nicolle Collelouri, pizzaiolo at the St Martin’s Lane PizzaExpress restaurant, said: “It’s been an incredible experience. “Of course, we all know how to flare but synchronising our timing was quite a challenge – and doing it in the few seconds we had when the traffic stopped, really added to the complexity. Joao Ferrari, pizzaiolo at the Euston PizzaExpress restaurant, added: “I was so excited when I heard about this opportunity and couldn’t wait to get involved. “I love pizza-flaring and have been doing this for five years. Zoe Bowley, managing director at PizzaExpress, said: “Our pioneering founder Peter Boizot introduced pizza to the UK in Wardour Street in 1965. “Peter leaves behind a wonderful legacy, which sees friends, families and loved ones enjoying pizza and good times together in our sociable pizzerias, every day, across the globe. “Today, 54 years on, we celebrate the special opening of PizzaExpress Langham Place, Oxford Circus – which is also the first to test our new brand proposition. “So, what better way to mark this celebratory occasion, than by bringing the art of pizza flaring to the streets like never before, as showcased by our 54 pizzaiolos from across the country”.